Brandon Heat was a part of the biggest corparation in the world, the Syndicate. They ruled over basically everything in their giant stratoscraper. One day, while riding up the HUGE elevator to the stratoscraper, Brandon's best friend, Harry, makes a plan to kill the boss and take over the company. But then Harry made one wrong move... he told Brandon that he could have the boss's wife. Although Brandon loved her, he was sickened by the idea. So he punched Harry, and Harry put 12 caps in his stomach, and then shot him in the eye, sending him falling from the very high elevator. After Harry took over, he started the Necrolization project, which was supposed to bring people back from the dead as super human zombies and help Harry take over the rest of the world. Once again, Harry did something very wrong. He used the project to resurrect Brandon and use him as part of his army. Now Brandon was a dead man. He had no memories or emotions. He was just one badly dressed killing machine. Brandon had become Beyond the Grave, or Grave for short. 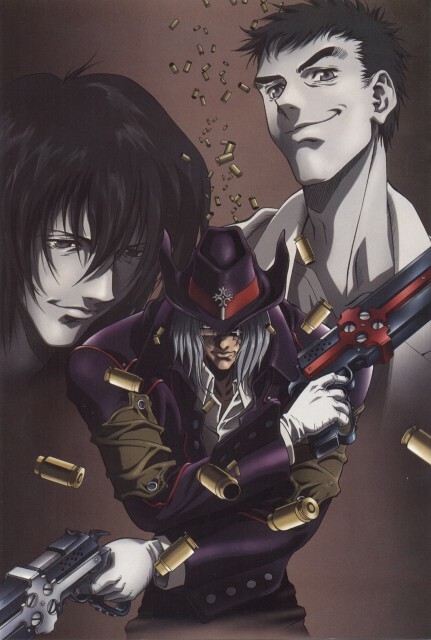 Grave, clad in really weird clothing, with his twin guns Cerberus and his coffin, went out into the world to find and kill Harry for all the trouble he has caused in the world. Now that Grave is a super human, nothing will stop him until he finds Harry, and finishes him off for good. Again I stress on the lack of a good quality dvd. The set I bought was BAD and the subtitles were SO messed up that they could misspell Balladbird to Ballbard or Ballerdbar and halfway through one episode who the HELL was JoYcE?? Or JoLicE..? Whatever. And the grammar oh Lord HELP me. Then there was this scene where it was black and something was happening at it was supposed to be something dramatic and sad and I couldn't see a damn thing because the whole thing was BLACK. It'll be hard to decide whether the presentation is good or not, since I haven't really got the original source to base my opinions upon. So I'm giving it a five for now. Dropped it after two episodes. I've since read that most fans consider the first episode to be trash and not worthy of watching because it spoils plot points needlessly, but even the second was tedious to get through and riddled with clichés. IDK, maybe this isn't for me. After six years of waiting I finally decided to watch it till the end, and it's one of the best dramas I've ever seen! Without silly conversations, rainbow dreams and unnecessary stories. Every character has his own purposes and ambitions but in the same time they serve to a global idea: one half is for old Big Daddy's Millenion and the other is for new rising order of Harry's Millenion. And this confrontation between both sides fulfills the series with endless turns of the plot what makes you switch to the next episod right after the end of the previous one. If you want to watch smth serious with deep psychological lines that is the very series you need! 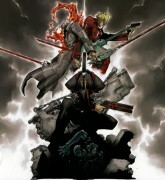 Gungrave was a little hard for me to grasp at first and to fully understand it's plot and where it was going since there is of jumping for his current time to back to his past, yet it wasn't really towards the second or third episode till I started to watch this more and grow a liking to it. Overall I wasn't fully thrilled with the animations or the illustrations, yet I liked the where the plot was trying to go. This is one of those shows for me where I was a little into, but since I started it I might as well finish it. This one is one of my favorite series. Masterpiece!